Storyline: The Wolverine (Logan) travels back to 1973 in the hopes of saving humankind. He gathers the X-Men and starts looking for Mystique, who apparently is the key to changing the future. Most ambitious version from the franchise. Amazing sets, cinematography, and 3D visual effects. Some critics complained that there was too much action in the movie. Every line of dialogue ended with an explosion or a fight. Visually, Days of Future Past is the most dramatic in the series, with amazing sets, cinematography, and 3D visual effects. Fans of the X-Men series will love this new addition. Days of Future Past is an upcoming 2014 superhero movie, directed by Bryan Singer. 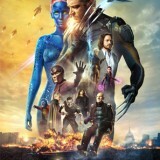 This 7th installment of the X-Men series acts as a sequel to “X-Men: The Last Stand” (2006) and “X-Men: First Class” (2011). Inspired by the storyline of Uncanny X-Men from 1981, “Days of Future Past” is centered on two time periods. The Wolverine (played by Hugh Jackman) is sent back to 1973 – his mission will be to save the future. With an estimated budget of $200 million, the movie includes other famous actors such as Jennifer Lawrence as Mystique, James McAvoy as Charles Xavier, Halle Berry as Storm, Anna Paquin as Rogue, and many others. “X-Men: Days of Future Past” premiered on May 10, 2014 in New York City and it was released on May 23. After receiving widespread critical acclaim, it became the most highly praised version from the X-Men series. After waking up in a much younger body back in 1973, Logan starts looking for a much younger version of Professor Charles Xavier (played by James McAvoy), who has spent the last decade of his life complaining about everything he lost. Beast (Nicholas Hoult) is Xavier’s only friend. Like other X-Men movies, the foundational conflict is that of humans vs. mutants. The humans fear and distrust the mutants, while the mutants try to become accepted in human society. At the second level, the leader of the X-Men, Xavier, wants humans and mutants to coexist peacefully, while Magneto believes that mutants must wage war in their own self-defense. This fear of people who are different, and recurring attempts to wipe them out, have been a theme throughout human history. By tying the movie to such a fundamental theme which continues to drive wars and shape our world, the film has a message with deep resonance and relevance. In “Days of Future Past”, these familiar conflicts return in unexpected ways. The humans do try to exterminate all of the mutants, and it appears that Magneto’s dark vision was correct. On the other hand, all of that was precipitated by Magneto’s own hostile actions, so it’s difficult to know what could have been otherwise. Several characters in the film end up confronting the central theme from their own unique perspectives, and ending up with very different conclusions. There is a great deal of soul searching and inner conflict, along with the dramatic external conflicts in the film. Find the most competitive price for X-Men: Days of Future Past in the table below. If viewing from a mobile device please click on + to get more information.